CCM veterans JARS OF CLAY talk about the album they say is "part confessional, part euphoric love poem, part bitter divorce and part benediction." Down the years Jars Of Clay have demonstrated quixotic changes of musical approach while continuing to hold on to a huge support base among American Christians. 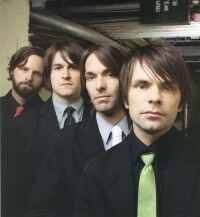 In 1995 they were being dubbed "alterna-folk" for their 'Jars Of Clay' breakthrough album. By 1999 'If I Left The Zoo' was offering everything from Sgt Pepper retro to hard alternative rock. And in 2003 there was bluegrass and country sounds on 'Who We Are Instead'. But it's the release of this year's 'Good Monsters' that has finally brought the band's stylistic eclecticism into sharp creative and commercial focus. It has already been named by the influential CCM magazine as the Best Album of The Year. What is particularly impressive about 'Good Monsters' is that despite featuring songs that are, in the words of CCM, "so well constructed, performed and just plain catchy," the album actually explores personal insights and theological and social issues at a greater depth than any previous Jars Of Clay album. The band's keyboard player Charlie Lowell told CCM magazine, "It feels like we wrote this record more for ourselves than our audience in the hope that, if the song gets me and the band really excited, it's going to resonate with people around our age that are thinking about similar things or trying to live in similar ways." The Jars lead singer and main songwriter Dan Haseltine spoke about the album, "There's more urgency in these songs. There's more honesty. In a way, we're weighing in on the bigger conversations we've kept ourselves out of for a long time. The conversations about relationships or social justice, but recognizing we don't have to be the voice of the Church." At the same time, much of the lyrical content on 'Good Monsters' hone in on intimate emotions. "I had a talk early on with Matt talking about the lyrics, that some of these songs were focused in on such a small amount of an emotion," Dan continued. "Jars has pretty much tried to focus on some 'big picture' ideas. When we write songs, the lyrics can tend to be pretty lofty, and this season has represented more of being comfortable with not sharing the whole front end or back end of a story, but just sharing the moment you're in." It's been known for some time that the band were feeling increasingly uncomfortable with their perceived role as some kind of spokesperson for Christians. "I think we've been a band that either by self-appointment or circumstance had to be the voice of the Christian community," said Haseltine. "After enough of that, you start to feel like that's how you have to write because you're forced into that perspective, and you have to give context for every statement you make. For every lyric, there has to be a sort of biblical mandate. What I've come to realise is that that's not how I live my life; it's not how any of these guys live their lives. We wrestle with stuff. We make mistakes. I make mistakes. When we're only writing songs that can provide a context, an argument for something, we aren't really sharing those moments." Said guitarist Steve Mason, "We are trying to bring the full weight and authority of the Gospel to the music. There's a tendency to condense the Scriptures, and especially what David said, to just take Pslam119 [and condense it to] a few highlights. But man, there was some serious.blues. Some serious darkness going on that he was accessing. But, for being a man after God's own heart, he asked a lot of what would be considered by today's standards 'insensitive' questions of God. I think that the Gospel's a much more frightening implication if we believe it until death - that He truly will raise us from the dead. There are far-reaching implications that we barely access and we barely allow ourselves to access." One of the cleverest aspects of 'Good Monsters' is the album's ability to explore intimate personal struggles and wed them to catchy pop rock rhythms. So a verse from the Talking Heads-style rhythmed "Dead Man (Carry Me)" contains the striking lines "I woke up from a dream about an empty funeral/But it was better than the party full of people I don't really know." Haseltine talked about the theme of the song. "I went to a funeral, and I sat there; it was an amazing event because person after person got up and described this person that had died, and you could tell they really knew him. And at that moment, I had this kind of crisis, 'Who knows me? Who would get up at my funeral and say those things for me?' I don't know, and I couldn't find anyone. And I went to the people who were close to me.and my perspective is kind of skewed because I have a sense that people know me less than they actually do. My own family, a lot of the times, I'll be surprised what they know about me. But, for the most part, I have the sense that I've lived a protected life; and I recognise that there's folly in that and some emptiness in that. So especially that lyric was just one way to say, 'I don't know which is better - not having anybody show up to my funeral or having a lot of people that don't know me at all." Mason chimed in to punctuate the point, "All set within the backdrop of a really poppy guitar song!" In the mainstream authors who expound their maverick spiritual epiphanies are gaining great popularity. Writers like Donald Miller (Blue Like Jazz) and Rob Bell (Velvet Elvis) are finding mass audience resonance as they express their own shortcomings to diminish their power. 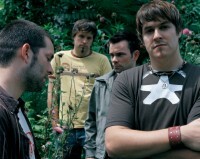 Miller in fact toured with Jars Of Clay on a series of dates. Commented Miller, "As they were writing many of these songs, we talked about what they encompassed. Dan said that he wasn't afraid to bring the full weight of who he was - and that's what he and they have done." Miller added, "The Scriptures say, 'Confess you're sins to one another and pray for one another, and you will be healed.' Modern Christian culture says, 'Hide your sins, and you will be a real model.' If you don't admit your humanity, then you have no place speaking into each others' lives." "In Africa," explained Haseltine, reflecting on the band's visits to the continent, "people embody their experiences, their emotions. When there's a funeral, there's wailing, and it isn't a bunch of people standing around trying to be strong for everybody else. When they're thankful or happy, they're not taking anything away from that experience because they're dancing or they're singing, and there's a real joy. In America, there are structures in place that keep us from actually experiencing the fullness of those emotions in life; you find in Africa they don't have much of a suicide rate - it's extremely low. Compare that to the US, where we have these structures in place to keep us at a certain level of emotional status. And what are we doing with our emotions? We're killing ourselves. It's stuff like that that's definitely informed this record." One of the most arresting songs on 'Good Monsters' is "Oh My God" which begins with Haseltine's near-whispered "Oh my God, can I complain?/You take away my firm belief and graft my soul upon your grief" and then builds into a rapid syllable rant of queries and assertions. The band's trips to Africa played their part in the shaping of the themes of 'Good Monsters'. Said the band's guitarist Matt Odmark, "Part of our trip to Africa (this year) was spending a couple days in Rwanda. You go to a place like Rwanda and it's like going to Auschwitz - a corner of the world where the worst thing that could possibly ever happen has happened, and to the 10th power. It's the hardest.it's what all of civilisation is trying to coordinate itself to avoid or ignore, and so part of our trip led us right into the heart of that. It just becomes very apparent - if you're going to talk about God at all in this life, and he doesn't have any power in that moment, then he doesn't really have any power at all. And I think - people in Rwanda, if they were crying out to God, then they needed a God who could raise people from the dead because any other kind of God was worthless to them." Added the band's guitarist Steve Mason, "For me, my power in leading in weakness comes from asking difficult questions of the Gospel and seeing them answered. But I diminish its power by not taking my questions there. And I think that if [the Gospel] is true, then it's got to be able to sustain the worst of our story and the most doubtful of questions and feelings. It's got to receive that. That's what the song is to me - 'come bring it all, you'll find an answer.'" Said Haseltine, "This is the first record that we've tried to even tackle some of what we've been experiencing in Africa in an actual song. There's a very fine line between writing a song that does more to strip away dignity from the people, to objectify their poverty or their experience. And it doesn't necessarily give a good communication of their real humanity and their real strengths. And I think that's what happens when you write story songs about a little kid who's sitting in Africa on a dirt pile, living in impoverished conditions. You can't really do that very well and really connect to people to make a difference. "'Light Gives Heat' is really one of those 'in the moment' songs," he continued. "This is how we really see the Western world approaching Africa - feeling in this day and age that we know better than Africans how to build their communities, how to heal their wounds, how to serve their sick. But the Western ideas aren't really the better ones; and it really takes Africans owning their place and their community to speak and to serve and to love people well. So that song is part critique of the way the Western world has approached Africa; and, then, the other side is our confessional, trying to be repentant of what we have done to perpetuate some of those bad forms of seeking justice. And I've gone in and said that thing that I've spoken against in that song. I've been that. Which is why the song had to simply not be a criticism but also had to be a confession." When CCM magazine asked Haseltine about the confessional aspect, the singer described his own upbringing and how it shaped his feelings and opinions for years. "I think that the first time I heard of Africa is similar to the way I related to American black culture in general. I grew up in Massachusetts, and there were two black girls in my class. The only thing I knew about them was that their hair was different, their skin was different. I knew about Rosa Parks; I knew about Frederick Douglass; and I knew about Martin Luther King, Jr. And every way I related to them was based on this kind of human rights/civil rights issues. So I would always engage with them on a level of being the white guy who feels sorry for them and wanted to help them out of their situation. "In either case, I was putting myself above them. I was still holding onto control in that relationship. And I wasn't meeting them on a level where we could actually be friends and I could actually listen to what they were saying and they could even hear what I was saying. So I think Africa's the same way, when all I heard of Africa was HIV/AIDS pandemic, malaria, famine, disease [and] poverty. The only way I could go in there is as the white guy that's ignored them for so long and, thus, has been part of the problem; or as the white guy who's going in to save them from their circumstances. And, again, those scenarios are both the wrong way to go in there. And I did - that's [my] first experience of going to Africa. Fortunately, I didn't have any money when I went, and I didn't really have much of an idea. So I had to go just to listen - I wasn't there to do anything. And, as difficult as it was for me, it was the greatest gift because all I could do was sit with people and take it in. There wasn't anything I could say because I didn't know enough about their situation. It was a humbling place to be, but one that afforded the opportunity to say, 'We need to hear from you how you want to build your communities. What is your culture like?' Blood: Water's kind of built off that, and it's a much healthier way to engage people. It's very freeing to go to Africa as a person that considers myself equal, if not completely unqualified to be there. I feel like I get to Africa, and I shrink down. I become this guy that's so out of my element; I don't know where to eat or even go to the bathroom in these places. They have to instruct me - and that's a really great place to be." 'Good Monsters' features some brilliant contributions from special guests. Nashville singer/songwriter Kate York features on "Even Angels Cry"; one time Sixpence None The Richer front lady Leigh Nash sings on "Mirrors And Smoke" while "Light Gives Heat" uses the voices of the African Children's Choir. Also, there's one non-original song on the album. Included is an uplifting cover of Julie Miller's "All My Tears", a long-time staple of Jars' live show. Commented Dan, "That was a scary song to try to do. We thought we had to tailor it to make it a little more rock and roll, and we were really scared because we wanted to honour how the song was originally written, about [singer/songwriter] Mark Heard and by Julie, who's experienced so much chronic pain in her life. All of these aspects go in to the song and when we finished, we thought it was good, but it was really scary that we did it this way. But then [Julie's husband/acclaimed guitarist and songwriter] Buddy Miller came into the studio and we just sat him down and played it for him, and he loved it. He said, 'Julie's going to think this is just an amazing gift.' That allowed us to have a lot more confidence about it." Now the album is out and selling by the bus load. The final word came from Dan. "I was not sure how all of the experiences of the last few years would translate into music. There have been so many things to look at and describe. This record is part confessional, part euphoric love poem, part bitter divorce and part benediction. It was born out of many experiences and conversations between addicts, failures, lovers, loners, believers and beggars. And so the language of recovery and the honest discourse about our attempts to live apart from God and apart from each other is a theme. Engaging people who are doing the hard work of laying their lives open to others and avoiding isolation has allowed me to see that there is both immeasurable evil and unfathomable good mixing under my own skin and it is grace, mercy and freedom that allow me to not simply be a monster, but to be a good monster."